Stephen Curry’s shot is on from everywhere, while Kevin Durant is his usual efficient, dominant self. Derrick Rose played five minutes in the first quarter for Minnesota and scored three points, then didn’t return because of left ankle soreness — two nights after the 2011 MVP scored a career-high 50 points in a victory against Utah. Alfonzo McKinnie added eight points and eight rebounds off the bench in the Warriors’ fifth straight home victory against the T-Wolves. “Over the course of 48 (minutes) if we stay locked in and focused, there’s going to be a breaking point,” Curry said. Timberwolves: Six players made a 3-pointer in the first half. … Minnesota is 0-4 on the road, three of those vs. the Western Conference. 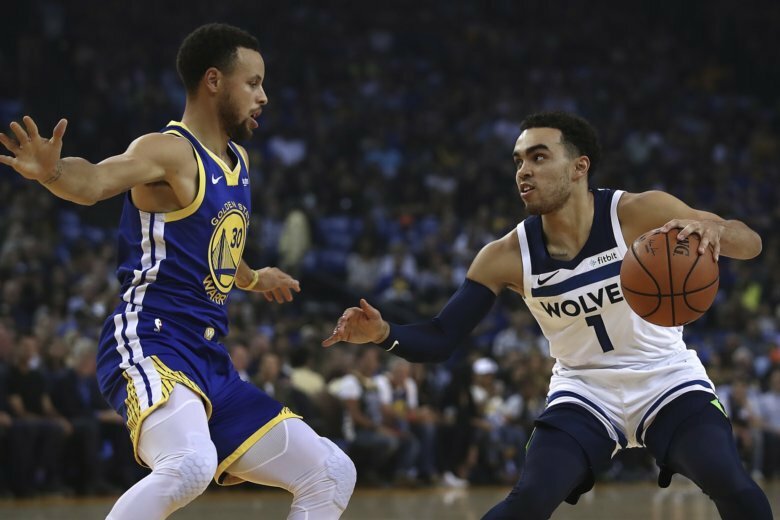 … The Timberwolves haven’t won at Oracle Arena since April 5, 2016, and have dropped 20 of the last 24 meetings against Golden State. Warriors: Had their six-game streak of scoring 120 points or more snapped. … Andre Iguodala shot 1 for 6. … G Shaun Livingston missed his fourth straight game with soreness in his right foot. Kerr listed Livingston as day-to-day. … Golden State had 31 assists after dishing out a season-best 39 on Wednesday. Golden State center DeMarcus Cousins has been scrimmaging full court 4-on-4 — the Warriors don’t have the bodies to go 5-on-5, Kerr said — and he is moving well and his shot looks strong as he recovers from surgery for a torn left Achilles. Yet that doesn’t mean Cousins will be in games anytime soon.